Citation: Narayanan.S, Pravin Kumar.M,Ramprasad.G ,Mohan.M. (2014). Randomised Data Concealment with Reversibility Improved Data Hiding In Encrypted Images. 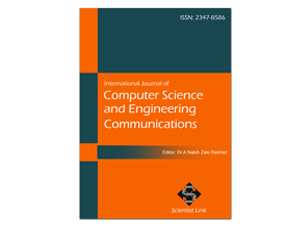 International Journal of Computer Science and Engineering Communications,Vol.2,Issue.2,pp.223-230. Steganography is used to hide data like text, image audio from unauthorized user in different manner. Data hiding method for images suffer from performance issues like low embedding capabilities, distortion or do not recover the original image completely. A novel reversible data hiding method is proposed. The pixel to which data is embedded is estimated in a random manner, these pixels are shifted and data along with the estimation errors are embedded in the image and these pixels are encrypted using a standard encryption technique. The rest of the image is then encrypted using a standard encryption algorithm. The image and data can be encrypted before data concealment for added protection. The embedded data can be extracted before or after the image is decrypted. This is possible by implementing a data hiding key. Thus, with the data hiding key, only the embedded data can be extracted revealing no information about the carrier image. The image is decrypted and can be recovered using the location maps created during the histogram shifting process. The various encryption levels in this method ensure a secure system. The proposed model exhibits high PSNR values and offers complete recovery of the hidden data and image. Keywords: Steganography, Chaos-encryption technique, Data hiding.\. The security is most important In general the concept of image processing is developed to conceal the data in a secured manner by means of steganography, because of these implementation data can be highly secured in many possible ways. In this paper, we are going to develop a new method to encrypt the images in such a way that the security level of the data concealment will be increased. We are going to implement an algorithm for encrypting images such that pixel will be determined in randomized manner and the estimation of pixels will be done before the encryption of the image. Then the data will be embedded in the respective pixel and after that the pixel will be rearranged and then the process of encryption will be handled so that the data concealment will be as we expected. Lossless data hiding in uncompressed image formats was discussed by Jessica Fridrich et al, (1), where uncompressed image formats can be used for embedding data by dividing the pixels into disjoint sets according to grayscale levels and using a discrimination function to flip LSB of the sets. Also they gave a method for embedding data in palette images such as GIF, by exploiting the limited colour palette of GIF images. Jun Tian gave reversible methods for reversible data hiding by exploiting the redundancy of the carrier (2). In the methods outlined, the data is embedded in pixels or groups of pixels that are chosen by a mathematical formula. Lossless Data Hiding for all Image Formats. Jessica Fridrich, Miroslav Goljan, Rui Du. San Jose : s.n., 2002. Spie Proceedings of Photonics West, Electronic Imaging, Security And Watermarking Contents. ing Difference Expansion. Tian, Jun. 8, s.l. : IEEE Transactions On Circuits And Systems For Video Technology, August 2003, Vol. 13, pp. 890-896. Reversible Watermarking using Difference Expansion. Tian, Jun. s.l. : Journal of Image Processing and Computer Vision. Expansion Embedding Techniques for Reversible Watermarking. Diljith M. Thodi, Jeffrey J. Rodríguez,. 3, s.l. : IEEE Transactions On Image Processing, March 2007, Vol. 16. A Novel Difference Expansion Transform for Reversible Data Embedding. Hyoung Joong Kim, Vasiliy Sachnev,Yun Qing Shi,Jeho Nam,Hyon-Gon Choo. 3, s.l. : IEEE Transactions On Information Forensics And Security, September 2008, Vol. 3, pp. 456-465. Reversible Watermarking Algorithm Using Sorting and Prediction. Vasiliy Sachnev, Hyoung Joong Kim, Jeho Nam, Sundaram Suresh, Yun Qing Shi. 7, July 2009, IEEE Transactions On Circuits And Systems For Video Technology, Vol. 19, pp. 989-999. DE-Based Reversible Data Hiding With Improved Overflow Location Map. Yongjian Hu, Heung-Kyu Lee, Jianwei Li. 2, s.l. : IEEE Transactions On Circuits And Systems For Video Technology, February 2009, Vol. 19, pp. 250-260. Efficient Reversible Watermarking Based on Adaptive Prediction-Error Expansion and Pixel Selection. Xiaolong Li, Bin Yang, Tieyong Zeng. 12, s.l. : IEEE Transactions On Image Processing, December 2011, Vol. 20, pp. 3524-3533. On Compressing Encrypted Data. Mark Johnson, Prakash Ishwar,Vinod Prabhakaran,Daniel Schonberg,Kannan Ramchandran. 10, s.l. : IEEE TRANSACTIONS ON SIGNAL PROCESSING, October 2004, Vol. 52, pp. 2992-3006. Commutative Encryption and Watermarking in Video Compression. Shiguo Lian, Zhongxuan Liu, Zhen Ren, Haila Wang. 6, June 2007, Ieee Transactions On Circuits And Systems For Video Technology, Vol. 17, pp. 774-778. Efficient Compression of Encrypted Grayscale Images. Wei Liu, Wenjun Zeng, Lina Dong, Qiuming Yao. 4, April 2010, IEEE Transactions On Image Processing, Vol. 19, pp. 1097-1102. Lossless Generalized-LSB Data Embedding. Mehmet Utku Celik, Gaurav Sharma, Ahmet Murat Tekalp, Eli Saber. 2, s.l. : IEEE Transactions On Image Processing, February 2005, Vol. 14, pp. 253-266. Lossless Data Embedding Using Generalized Statistical Quantity Histogram. Xinbo Gao, Lingling An, Yuan Yuan, Dacheng Tao, Xuelong Li. 8, August 2011, IEEE Transactions On Circuits And Systems For Video Technology, Vol. 21, pp. 1061-1070. Reversible Data Hiding. Zhicheng Ni, Yun-Qing Shi, Nirwan Ansari, Wei Su. 3, March 2006, IEEE Transactions On Circuits And Systems For Video Technology, Vol. 16, pp. 354-362. Reversible Data Hiding in Encrypted Image. Zhang, Xinpeng. 4, April 2011, IEEE Signal Processing Letters, Vol. 18, pp. 255-258. Separable Reversible Data Hiding in Encrypted Image. Zhang, Xinpeng. 2, April 2012, IEEE Transactions On Information Forensics And Security, Vol. 7, pp. 826-832. The Scalar Scheme for Reversible Information-Embedding in Gray-Scale Signals: Capacity Evaluation and Code Constructions. Sian-Jheng Lin, Wei-Ho Chung. 4, August 2012, IEEE Transactions On Information Forensics And Security, Vol. 7, pp. 1155-1167. An Improved Reversible Data Hiding in Encrypted Images Using Side Match. Wien Hong, Tung-Shou Chen, Han-Yan Wu. 4, April 2012, IEEE Signal Processing Letters, Vol. 19, pp. 199-202. Reversible Image Watermarking Using Interpolation Technique. Lixin Luo, Zhenyong Chen, Ming Chen, Xiao Zeng, Zhang Xiong. 1, March 2010, IEEE Transactions On Information Forensics And Security, Vol. 5, pp. 187- 193. Robust Reversible Watermarking via Clustering and Enhanced Pixel-Wise Masking. Lingling An, Xinbo Gao, , Xuelong Li, Dacheng Tao, Cheng Deng, Jie Li. 8, August 2012, IEEE Transactions On Image Processing, Vol. 21, pp. 3598-3611. Reversibility improved data hiding in encrypted images. Weiming Zhang, Kede Ma, Nenghai Yu. s.l. : Elsevier, 29 June 2013, Signal Processing, pp. 118-127. Video Fingerprinting and Encryption Principles for Digital Rights Management. Deepa Kundur, Kannan Karthik. 2004. Vol. 92. Chaotic Image Encryption Algorithm Based on Circulant Operation. Xiaoling Huang, Guodong Ye, Kwok- Wo Wong. Hindawi Publishing .19 June 2013.